Create records of customers and staff to keep track of who’s using your services. Information silos are a problem for every organization. With Service Desk, you can break them down. As your technicians do what they do best, they can create articles that capture their knowledge about your services. The articles can then be shared with co-workers or customers to provide quick answers for common issues. Creating a new article is simple. Pick a title, write the content and choose whether to publish it internally for your team or externally for everyone. You can see how many times the page has been viewed, and customers can mark articles as useful so you know if it’s helping. You can even allow comments to encourage discussion and questions. When something goes wrong, many people search help sites first. If they can find the answer in an article and resolve the problem themselves, they’re happier for it — and so are you. 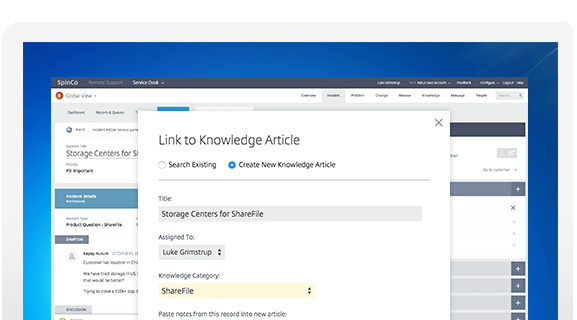 A robust library of knowledge articles ensures that you’ll see fewer requests for support. Why reinvent the wheel? Once you’ve resolved an incident, you can use it to create a new knowledge article that automatically captures your notes on the symptom and resolution. You can even include the discussion you had with the original customer. It’s a quick and convenient way to share solutions. 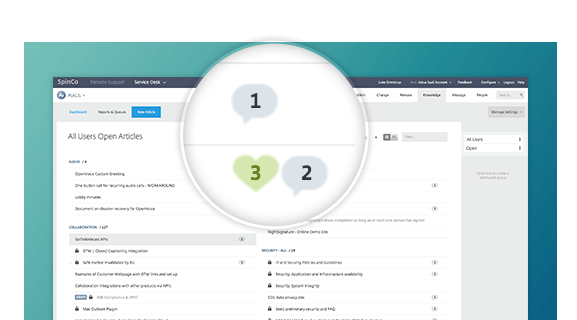 Learn more about GoToAssist Service Desk features. Set up an easy-to-use portal where customers can create tickets, track progress and provide feedback. Talk with your team, make service announcements and discuss issues with customers.